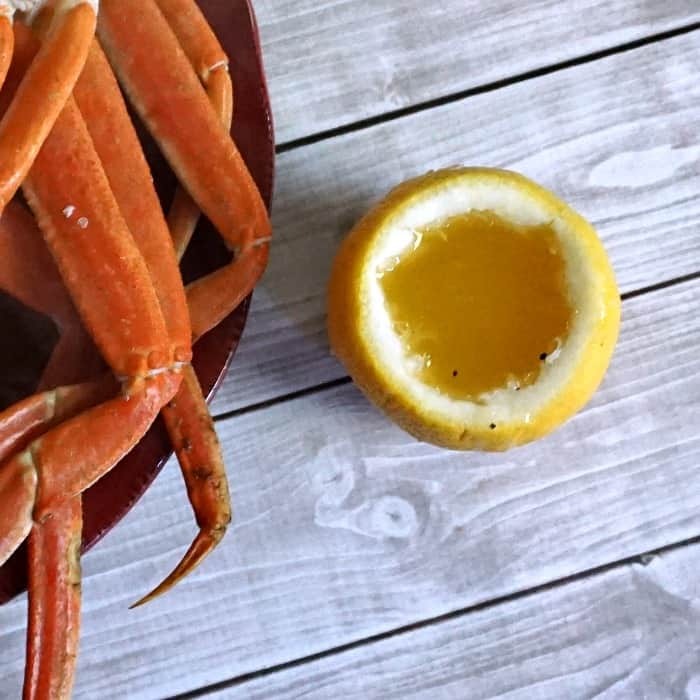 Ok, so I’m kind of obsessed with the idea of a big, juicy steak with crab legs and all this butter dripping off it…yeah, so despite this obsession, I rarely–RARELY–if ever, get my wish. But sometimes I indulge and when I do…oh, baby…I really indulge. 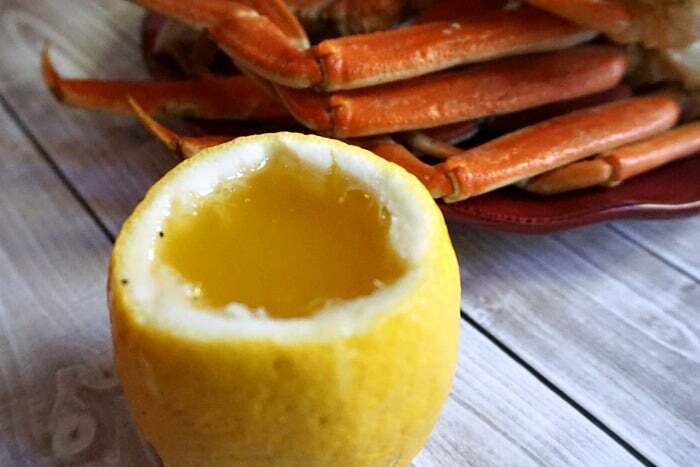 I even go so far as to make Garlic Lemon Butter for Dipping Crab AND I put it in a little Lemon Cup, which is so perfect, I can’t even. The idea for this Garlic Lemon Butter came to me a few years ago when I was trying (unsuccessfully) to figure out how to make some bread lemony. I’d already made garlic butter to slather over it, then this lemon bread…well, needless to say, the bread turned-out weirdy, but the flavors–well, that’s why we’re here, isn’t it? My mom always did say “look for the silver lining”. Heh. 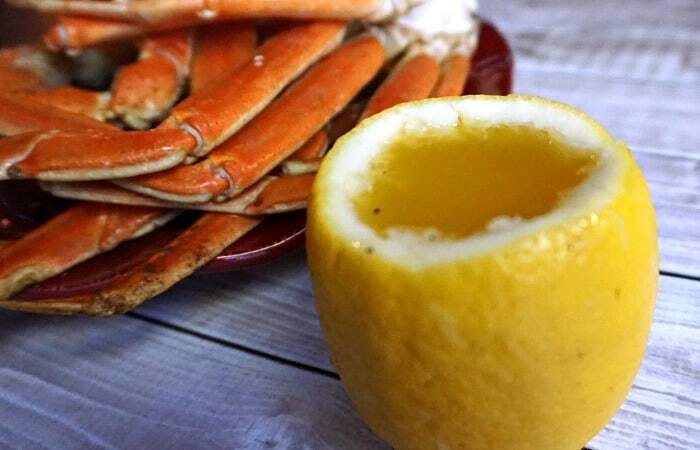 For dipping crab, I make Garlic Lemon Butter for Dipping Crab AND I put it in a little Lemon Cup, which is so perfect, I can't even. Place butter in a small sauce pan over medium heat. As the butter melts, skim off the foam. Once you have skimmed the foam off, allow the butter to settle (meaning don't stir it). The butter will separate on it's own. Carefully pour the top layer into a bowl. Discard the solids that settled in the bottom of the pan. Add the garlic, parsley and lemon juice to the bowl with the clarified butter. Carefully pour into the lemon cup! Alright, so this is why half of you are here, right? I mean, you want to know how I made the cute little lemon cups to put the butter in? Well, it’s super easy. Buy really big lemons–the biggest you can find. Cut off the top 1/8 of the lemon, discarding the top or keeping it for aesthetics, whatever. Trim off the tiniest portion you can from the bottom, but leaving a flat place that will stand when set on a flat surface. Using a sharp knife, carefully cut the meat from the center of the lemon to about 2/3 of the depth of the lemon. I found the easiest way to do this is by cutting out the sections like some kind of twisted way to peel it…I couldn’t take a photo and show you–besides that wouldn’t tell you much since it’s like a full-body experience…long story. Set the lemon on the table and pour (gently) your garlic lemon butter inside. You can also dip the bottom in paraffin wax to keep it from leaking, but, honestly, it’s not necessary. If you cut the bottom off very shallowly, the rind will be adequately thick enough to keep it from going all over. 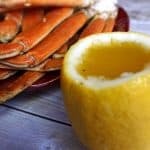 So, what do you think about my Garlic Lemon Butter for Dipping Crab and tutorial for How to Make Lemon Cups? 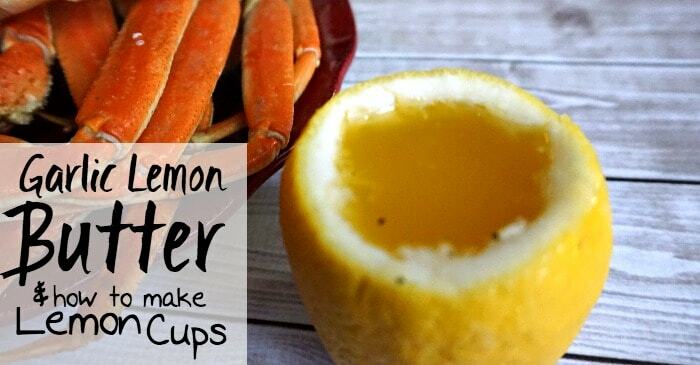 Think you might try it the next time you have crab legs? Maybe with mudbugs? Lemme know! I’d love to have a little comment from you telling me how this works out for you.